Lisa Crawford Bruch, most recently senior director of government strategy at CenturyLink (NYSE: CTL), died on Dec. 17 at the age of 62. Family, friends and colleagues are invited to attend a celebration of her life at Mount Olive Baptist Church in Centreville, Virginia, on Saturday, Jan. 5th, from 10 a.m. to 3 p.m.
CenturyLink said the three-decade government contracting veteran spent her last 11 professional years supporting the vision and executive strategy at the telecommunications firm’s government business. “While many of you have known Lisa for a long time, I’ve just had the privilege of working closely together with her for the past year, and she has had both a personal and professional impact on my life. She will be greatly missed by us and her broad circle of people she touched across our industry,” David Young, senior vice president of strategic government at Centurylink, said of Bruch’s passing. Prior to CenturyLink, she served as president and CEO of consulting firm The Crawford Group. She previously held executive roles at AT&T‘s (NYSE: T) government market and global sales groups. 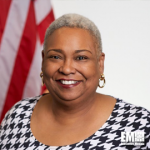 Bruch was an alumna of Lincoln University and Pennsylvania State University’s Smeal College of Business and a member of the National Contract Management Association for 32 years.